Recycled silk yarn is a lovely fiber that also happens to help people and the planet. As the name implies, recycled silk yarn is made from recycled silk, more specifically the waste silk from industrial weaving mills in India (the silk is mostly used to make saris). The yarn is hand-spun , giving women there a way to work and earn money. It's beautiful all around. Because the hanks of recycled silk yarn are made individually, each one is unique. 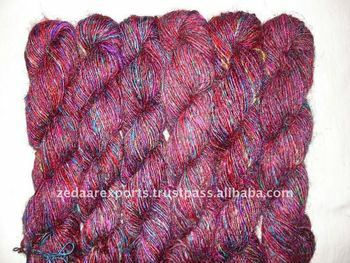 There's no dye lot on recycled silk yarn, and even if you buy two hanks from the same manufacturer at the same time there's no guarantee that the colors are going to be the same. But really that is the beauty of using recycled silk. Each piece has its own individuality and everything you make from the yarn is its own work of art, completely unique.